Initially this trip was organized for our Study Abroad student from the US. I invited two other students from Cornerstone Institute to join on this occasion. 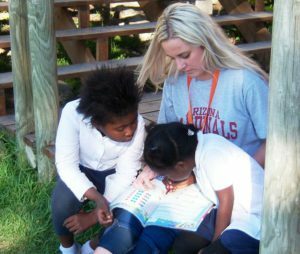 The reason why I chose these Cornerstone students was that both of them showed interest in working with and in communities. In classrooms you learn theory, and there comes a time where theory needs to be tested for its validity in the field. In order to do so, one has to ‘get out there’. 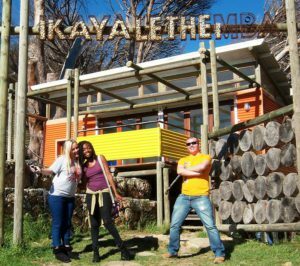 We first went to iKhaya le Themba, an afterschool project for children at risk. iKhaya le Themba is a “seeker” initiative rather than a “planter” initiative. Susan Hill, the director, told us about the history and the present state of the organization. 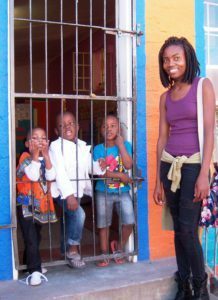 iKhaya le Themba offers holistic care and family support to orphaned and vulnerable children in ImizamoYethu, a settlement which battles the effects of poverty, HIV/AIDS, trauma and learning disabilities. 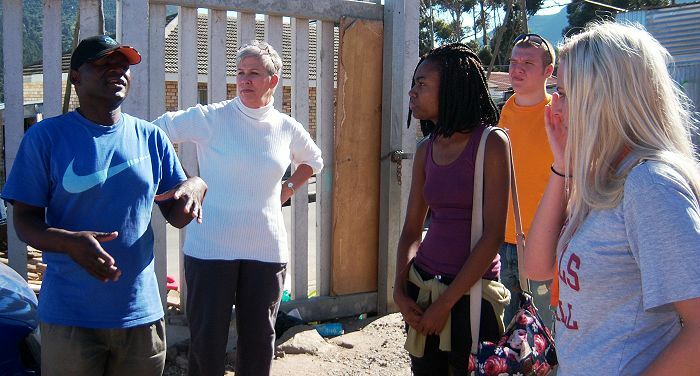 Phila took us on a township tour where he showed us several initiatives in the community. 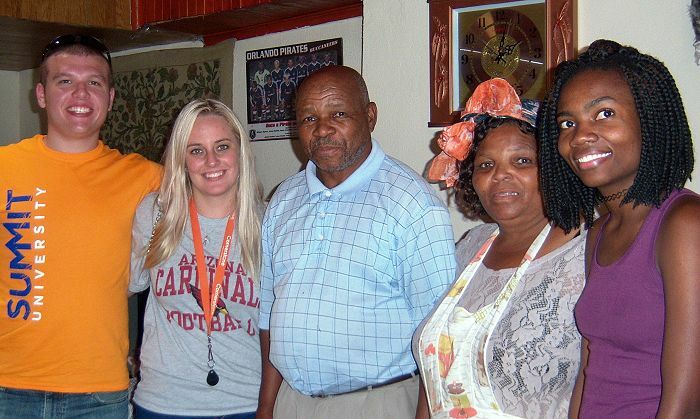 He told us the history of the fairly new township with approximately 6,000 households. ImizamoYethu is isiXhosa for ‘our struggle’. He showed us three preschools; some were more organized than others. He showed us the community hall, where the first church service was held in the beginning of the community. Finally we went to a hall in which 10 elderly people are being looked after. We had lunch at Miriam and her husband’s house and she told us about the soup-kitchen she runs for the clinic. She started doing this after she saw patients passing out after taking their TB medication on an empty stomach. 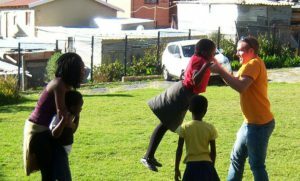 The visit ended on a high note when we played with the children at iKhaya le Themba as they arrived from school. The experience was, as always, rewarding and soul enriching. Sytske P, self-funded Cornerstone associate. What an amazing experience it was visiting ImizamoYethu and interacting with the people there! My goal and dream is to work with communities and helping them achieve a better future. Going on this field trip opened my eyes to the fact that we can’t just go into a community and try to improve everything that we see as wrong. However, we can encourage the community to take part in change. I thought it was amazing to see how ImizamoYethu is doing all of this. It was a wonderful opportunity and I would love to go back and give love to these people. It was good to see how much is happening in the township and seeing that it is the people from the community who want to bring change.All we usually see from driving past is the outside, and I had the privilege to see the inner beauty of this community. First of all I would like to thank God for speaking to your heart, Sytske, and making this trip happen. I would like you to know that it was a privilege to be part of the adventure and I cannot thank you enough for giving me the opportunity. I must say, it was one of the most inspiring, informative and enriching exposures anyone could ask for. I found the trip very informative and beneficial, both academically and personally. In terms of academics, I was able to marry some theories with practice. Learning from books and media is one thing but experiencing or entering into reality is another. This experience provided me with the opportunity to witness, in a palpable way, various challenges that individuals in townships face on a daily basis. Also learn about various projects that are being run in the community, their impact and their struggles. At the personal level, I was inspired as I listened to testimonies of members of the community. Their stories of resilience and generosity, not only inspired but also challenged me both as a Christian and student. It brought me to reflect on where I am at and where I want to be in terms of achieving God’s purpose for my life. I can confidently say it was worthwhile.